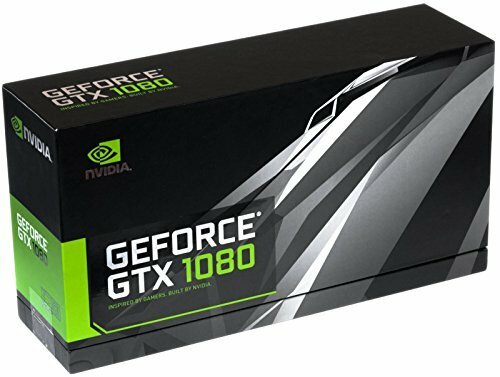 NVIDIAs new flagship GeForce GTX 1080 is the most advanced gaming graphics card ever created. Discover unprecedented performance, power efficiency, and gaming experiences-driven by the new NVIDIA Pascal architecture. This is the ultimate gaming platform. 8GB GDDR5X memory. PCI Express 3.0. HDMI, DVI-D and DisplayPort outputs. 1607MHz clock speed. 256-bit memory Powered by the NVIDIA GeForce GTX 1080 graphics processing unit (GPU) With a 1607MHz clock speed and 1733MHz boost clock speed to help meet the needs of demanding games. 8GB GDDR5X (256-bit) on-board memory Plus 2560 CUDA processing cores and up to 320GB/sec. of memory bandwidth provide the memory needed to create striking visual realism. PCI Express 3.0 interface Offers compatibility with a range of systems. Also includes DVI-D, HDMI and 3 x DisplayPort outputs for expanded connectivity. NVIDIA Ansel Revolutionary new 360-degree image capture. NVIDIA SLI-ready Transmits synchronization, display and pixel data for reliable connection between GPUs (additional graphics cards not included). NVIDIA G-SYNC technology Scenes appear instantly, objects look sharper, and gameplay is super smooth, giving you a stunning visual experience and a serious competitive edge Microsoft DirectX 12 Support for the latest Microsoft DirectX API to enable next-generation gaming. OpenGL 4.5 Support Supporting the latest standards in the OpenGL API. Vulkan API A next generation graphics and compute API from Khronos Group that provides high-efficiency, cross-platform access to modern GPUs.